PCI DSS 3.2 is expected by the end of April 2016, and Dara Security has provided an overview of the expected changes. One of the changes discussed is about the use of SSL/early TLS as a security control. The date to stop the use of SSL/early TLS has been extended to June 30, 2018; however, new implementation must not use SSL/early TLS at all. Further, if you continue to use SSL/early TLS until June 30, 2018, you must have a “Risk Mitigation and Migration Plan” in place. This document should provide details about your plans to migrate to a secure protocol and the controls you’re using to reduce risks until your migration is complete. The PCI Security Standards Council provides a document about migrating from SSL and Early TLS, which includes risks of using SSL/early TLS, the PCI DSS requirements affected, information about a Risk Mitigation and Migration Plan, and Frequently-Asked Questions. For information about keeping your customers’ sensitive information secure with InOrder, please contact us. A wish list is a basic feature of online stores that let customers buy when they’re ready, and makes ordering and re-ordering easy. The InOrder Wish List feature allows web customers to build a list of products they hope to purchase in the future. Users may add items to their wish lists, in addition to placing “regular” orders on the web site. The InOrder Wish List is maintained as a separate order, which enables them to be viewed or edited from InOrder in the same real-time fashion as regular web orders. Inventory levels are not affected by wish lists until wish list items are added to the shopping cart. When a customer adds an item to his/her wish list or views the wish list, the View Wish List page is displayed. Items may be removed from the wish list and quantities may be updated on the View Cart page. Shoppers may add one or all items from their Wish List to their shopping cart, and they may move items from their shopping cart to a Wish List. If enabled by your settings, items on a shopper’s wish list may also be displayed on a carousel on the home page. Allow customers to convert their wish list into an active shopping cart. Allow customers to move items from their current shopping cart to their wish list. Allow Customer Service Reps to view a customer’s wish list and edit it when necessary. This can be useful when talking to a customer. Allow your Marketing Department to collectively report on and review items from customer wish lists. This can be helpful when making pricing or reorder decisions. Display wish lists on a carousel on the home page. Inventory levels are not affected by wish lists until wish list items are added to the shopping cart. Contact us for more information about InOrder Wish Lists features. How Many Ways Does an ERP System Improve Your Business? An ERP system can help your business thrive by aligning with your business strategy, improving decision-making, and improving responsiveness to your customers. An ERP system integrates information across your organization. It relies on a single database and automates the flow of information. It keeps all of your information in one place, and easily lets others across your enterprise view it, including marketing, customer service reps, and management. This data sharing leads to greater efficiency within your organization. A well-designed ERP system incorporates the aspects of your business to give you a clear view of it. Real-time inventory and order tracking provides up to the minute views of what is in stock and where, across all channels, including retail point of sale, call center, and the Web. An ERP system integrates your systems and processes with everything you need to manage your business, from financials to CRM. Keep track of products, customer spending patterns, available credit, and how much they owe. You can even automate tasks, such as providing shipping and delivery estimates, recovering abandoned carts to increase your revenue, prompting customers to visit your website using your packing slips and receipts, or avoiding backorders resulting from high volume customers. 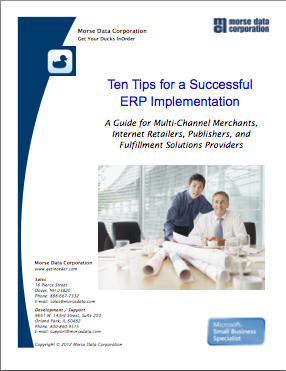 So, how many ways can an ERP system improve your business? The InOrder Team is attending the 5th Annual Operations Summit in Cincinnati OH April 12-14 at Duke Energy Convention Center. If you’ll be at the Operations Summit and you’re for a place to eat while you’re there, here are my Cincinnati restaurant picks and reviews, for your stay at Operations Summit 2016. Only a 15 minute walk to the corner of 12th and Vine. A must-try home-made waffle experience that is worth any wait time. And there is always a wait time; however, they do take some reservations. Best for breakfast or brunch. 80% of customers order the shiracha chicken and waffle dish, and I would again every time. An upscale bar with great eats, just across the street from Bakersfield and kiddy-corner from Taste of Belgium. Mexican fare that includes my favorite short rib tacos, just across the street from Senate Pub and kiddy-corner from Taste of Belgium. A 6 minute drive, or a 10 minute bus ride, North down Elm and into the Findlay Market. Known for their pho noodle soup, and a phenomenal banh mi (gilled lemongrass pork) sandwich. A 15 minute drive East, down the Ohio river but still in Cincinnati limits. A medium sized home-made diner atmosphere, full of nostalgia and circuses. Best juicy burgers in Cincinnati, and one of the top places ever featured on Diner’s Drive-in’s and Dives. Terry’s decor is full of bells and whistles. Also Terry and his brother frequently engage the audience to provide back stories, trivia, and laughter. Just across the Ohio River in Kentucky, this down-home fine dining establishment works great for lunch or dinner. Reservations are recommended. All three locations are in the Northeast suburbs of Cincinnati. At the nearest from the Convention center (under 30 minutes) in Blue Ash Ohio, usually all the seats are just about taken, but I’ve never waited more than a few minutes. Blue Ash Chili is an flavorful chili experience that for chili fans, is definitely worth passing the Cincinnati skyline. Several clever dishes add chili to a few special foundations such as spaghetti or over fried jalepeno caps. A dive cafe featuring rich and savory caribbean chicken plates. A tiny Cafe, with a daunting but quick line that usually runs out the door, but a clever system that gets you a table when your food is ready. The perfect savory Melt sandwich can be had here. When you consider all the payment types that your business accepts, do you ever consider electronic checks or mobile payments? Along with major credit card gateways and PayPal, InOrder also integrates with My eCheck, an efficient and low-cost payment system. My eCheck provides impressive electronic payment solutions for all InOrder users, from real-time mobile payments to custom enterprise solutions. Payments made using My eCheck’s eMobile are 100% guaranteed. Reduces the risk of fraud and data theft. Available on most devices with no additional hardware requirements. Works with customer rewards and loyalty plans. Accept real-time payments on your website with electronic account transfers, with a guarantee on all transactions. For more information about processing My eCheck payments with InOrder, please contact Morse Data Corporation.